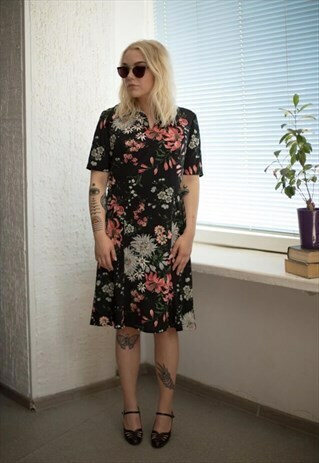 Vintage 80's black flower patterned short sleeved midi dress with v -neck, burgundy inner lining and zip up back. UK size not written but looks like 10-12. Model size in the photo - 8-10. Measurements: length 39 inches, sleeves 10.5 inches, chest 36 inches, waist 34 inches.